Blanket Answer is a unique blend of minerals and enzymes . The special formula works where many bacteria cultures fail. It is 100% safe for all pond fish, plants, and biological filtration systems. UV units or protein skimmers need not be switched off, unlike other products on the market. Blanket Answer is simply added to the pond by pouring the mixed powder and pond water from a designated watering can evenly over the surface. The pond will initially take on a milky appearance, but this will clear after about 5 days. 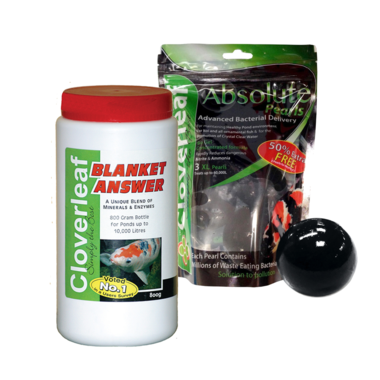 Cloverleaf Absolute Pearls are a natural product that contains millions of microscopic nitrifying bactera and bio active Enzymes that rapidly go to work in your pond. 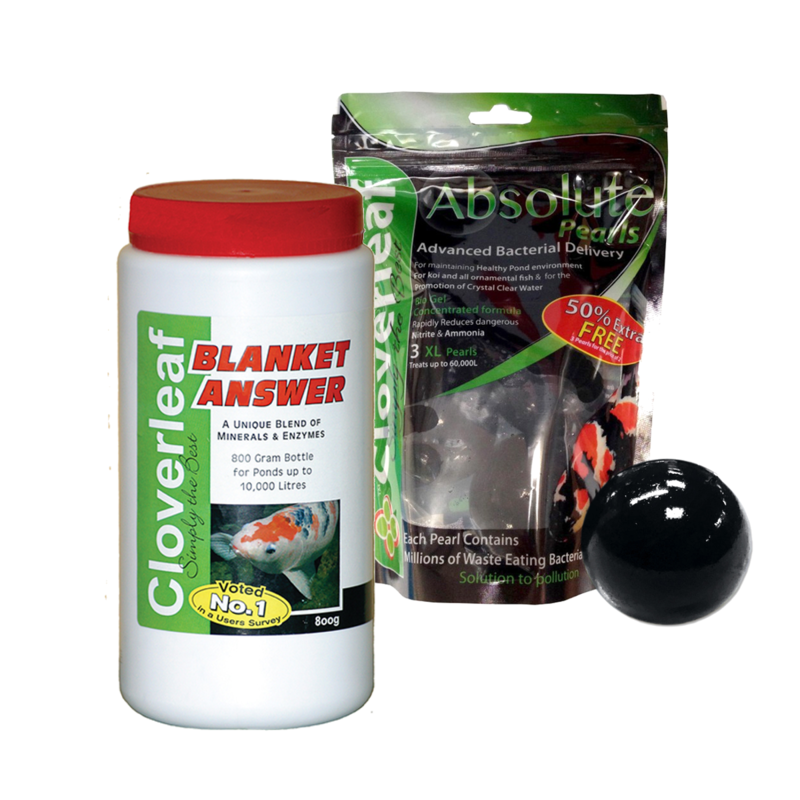 Designed to take care of breaking down harmful levels of Nitrite and Ammonia, Cloverleaf Absolute Pearls clear up any waste build up in your filtration systems and helps to keep your pond looking crystal clear. How to use Absolute Pearls: Simply drop an Absolute Pearl ball into your pond filter or straight into your pond water. One 50mm Absolute Pearl will treat up to 20,000L and can not be over dosed. For a Limted Time Get 50% Extra Free in each pack of Absolute Pearls. Leave 10 day after use before introducing any other chemical treatments.